HomeFREEDOMGuess Who’s Behind Facebook’s New ‘Fake News’ Detector? Guess Who’s Behind Facebook’s New ‘Fake News’ Detector? As anyone active on the Internet is aware, there have been increasing calls for social media companies (Facebook, Twitter, etc.) to address the mostly manufactured crisis of “fake news” making its way onto people’s computer screens. The mainstream media, which finds itself increasingly viewed as untrustworthy by the American public, has latched on to the idea that the relatively free flow of ideas and opinions on the Internet actually poses a threat to our well-being. There has to be, I think, some sort of way in which we can sort through information that passes some basic truthiness tests and those that we have to discard. … The answer is obviously not censorship, but it’s creating places where people can say ‘this is reliable’ and I’m still able to argue safely about facts and what we should do about it. This isn’t about politics or partisanship. Lives are at risk — lives of ordinary people just trying to go about their days to do their jobs, contribute to their communities. It’s a danger that must be addressed, and addressed quickly. Lives are at risk! It was only a matter of time before some of these social media behemoths embraced the requests of the elites they most identify with. Yesterday, Facebook announced that it was going to employ a variety of “fact-checking” organizations to make sure no “fake news” made it onto people’s Facebook news feeds. So Facebook will be using Snopes, PolitiFact, Factcheck.org, ABC News, and the Associated Press, among others, to check its members’ postings and label them as “fake news” if these organizations determine them to be so. One problem: these organizations themselves are among the biggest purveyors of real fake news! PolitiFact has a whole website dedicated to exposing the organization’s biases. The popular site Snopes is in fact run by a husband and wife out of their home in California. Neither have any background in research or investigative techniques — they just use Google to make their determinations. As for AP and ABC News — they are mainstream media outlets with no clean hands when it comes to propagating fake stories. In fact the Associated Press has a long history of coordinating with governments to produce fake news. Political fact checking is not a science. On the contrary, more often than not it carries with it all the biases of any hyper-partisan organization. Who are they? 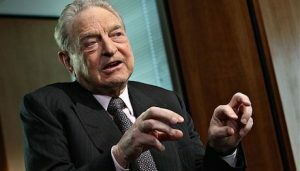 George Soros, otherwise known as Hillary’s sugar daddy. EBay founder Pierre Omidyar who’s given more than $30 million to the Clintons and their charities. Google — “in like Flynn” for Hillary. The Bill and Melinda Gates Foundation. And the commie/neocon National Endowment for Democracy (which, as a government-funded entity, will be using our own money to censor news it deems harmful to us). These are the people who will decide what you will see on Facebook. Are you happy to be thusly protected?